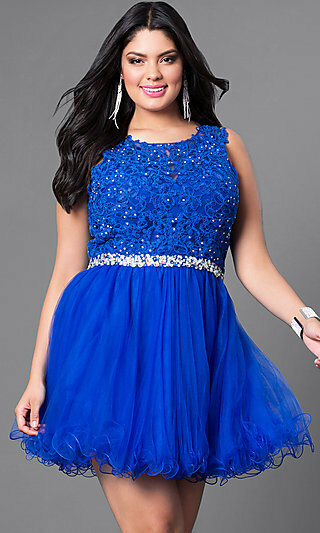 Plus-size party dresses and special-occasion dresses in plus sizes are available in an array of styles, colors, and fabrics to ensure an ideal look for every woman and any event. In this assortment of party dresses in plus sizes you will find short plus party dresses, high-low casual party dresses, and knee-length form-fitting plus dresses. There are unique plus-size print dresses and fashion-forward party dresses with some of the season’s hottest features like off-the-shoulder and cold-shoulder necklines, lace or ruffle accents. So whether you have a semi-formal, formal, or casual party to attend, do so looking and feeling your best in a plus-size party dress from Simply Dresses. 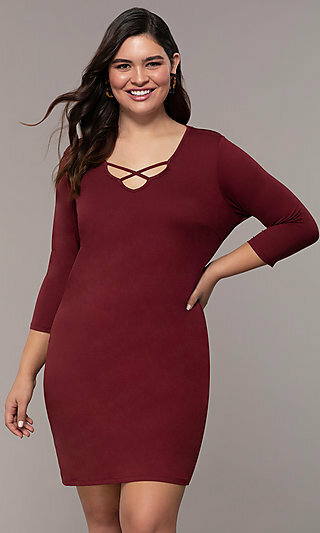 Where Can I Find the Best Party Dresses in Plus Sizes? With such a variety of styles, finding your ideal plus-size party dress is a breeze at Simply Dresses. Celebrate your curves in a form-fitting short plus-size dress or trendy off-the-shoulder plus party dress with ruffled flounce. A plus-size lace party dress is ideal for portraying a flirty, romantic vibe, while a shift dress in a bold print is a fun way to showcase your personal style in comfort. Illuminate any event when you slip into a dazzling cocktail plus party dress adorned with light-catching sequins. For a more modest look, try one of the special-occasion dresses in plus sizes accented with classic pleats, ruching, or detailed embroidery. Whether you’re searching for a contemporary or classic style, at Simply Dresses you’ll find plenty of gorgeous plus-size party dresses from which to choose. Many of the party dresses in plus sizes offered in this collection are designed with figure-flattering features to help you achieve a beautiful feminine silhouette. A short plus-size dress with a trendy scalloped neck or hemline will draw attention away from your mid-section. Need to add volume to your upper body? Try a plus-size party dress with cap sleeves or a short party dress with a ruffled popover accent. Ruching is another wonderful design technique for plus-sized figures. Utilized to conceal problem areas or divert focus, a ruched plus-size party dress is great for highlighting your best assets while hiding others. Whatever your personal style, the variety of couture party dresses in plus sizes offered at Simply Dresses ensures you can celebrate in style at your next special occasion.